Founded in 2016 The Indianapolis Quartet (TIQ) is the ensemble-in-residence at the University of Indianapolis, reaching audiences through its unique musical language and emotional performance style. TIQ has collaborated with pianist Orli Shaham, cellist Mark Kosower and clarinetist Todd Palmer, and played standing-room-only performances to critical acclaim. In addition to their regular concerts, masterclasses and open rehearsals at the Christel DeHaan Fine Arts Center, TIQ performs in venues throughout central Indiana and made its Chicago debut in the spring of 2018. 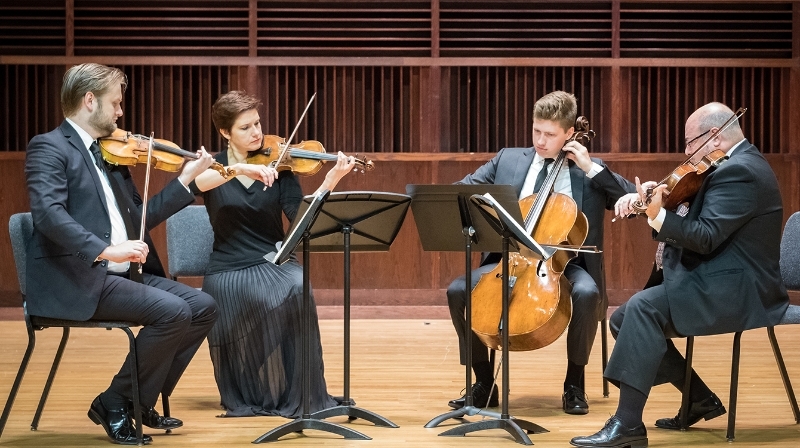 The quartet is exercising its mission to gradually expand its reach and represent The University of Indianapolis not only regionally, but also nationally and internationally, as it continues to build its repertoire of world-class music. Known for his virtuosic, high-energy performances, violinist Zachary DePue, former concertmaster of Indianapolis Symphony Orchestra has a busy career as soloist, chamber musician, fiddler, community leader, and mentor with passion and dedication. A rising star among both classical and crossover music fans, he became one of the youngest concertmasters in the country when he was appointed in 2007. DePue is a founding member of Time for Three, ISO’s first-ever ensemble-in-residence. He graduated in 2002 from the Curtis Institute of Music in Philadelphia, where he studied with renowned violinists Ida Kavafian and Jaime Laredo. DePue’s violin was made by Ferdinand Gagliano of Naples, Italy, in 1757. Joana Genova is Assistant Professor of Violin and Director of Chamber Music Initiatives at University of Indianapolis, second violinist of The Indianapolis Quartet and co-founder and Artistic Director of Taconic Music in Manchester, VT. Ms. Genova began playing violin at the age of six in her native Bulgaria, made her solo debut at the age of twelve and is a prizewinner of Bulgaria’s National Competition. 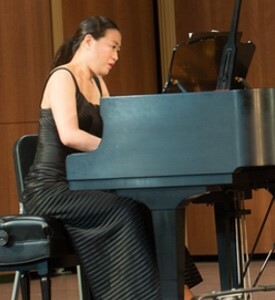 She earned her Bachelor of Music at the Conservatory of Amsterdam and her Master’s in chamber music at the Rotterdam Conservatory in the Netherlands. Her former teachers include Peter Brunt, Ilya Grubert and Samuel Thaviu. In Holland, Ms. Genova was concertmaster of the Amsterdam Bach Consort and a member of Amsterdam Sinfonietta. Ms. Genova performs with Taconic and Williams Chamber Players and is a frequent guest at festivals and concert series on the East Coast, Wyoming, Colorado and Arizona. She is on the summer faculty of Taconic Music’s Chamber Music Intensive, InterHarmony International Music Festival in Italy and Music&More SummerFest in Bosnia-Herzegovina. Violist Michael Isaac Strauss performs around the world as a solo, chamber, and symphonic musician. 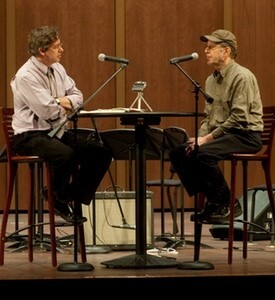 His love for the intimate concert setting has led to performances on concert series, live-radio broadcasts, and festival appearances across Europe, North America, and Asia. A former member of the distinguished Fine Arts Quartet, Strauss made several European and domestic tours with them, as well as a critically acclaimed recording of Mozart’s complete viola quintets on Lyrinx. His solo work is featured on several other CDs – the first recording of Jennifer Higdon’s Viola Sonata, David Finko’s Viola Concerto (re-released in 2015), Stamitz’s works for solo viola with orchestra (Centaur), and the Suzuki Viola School CDs, Volumes 8 and 9. Additional chamber music recordings with the Philadelphia-based Orchestra 2001 include pieces by living composers. In 2016, he released Wordless Verses – trio works inspired by poetry for oboe, viola, and piano – distributed by Naxos. 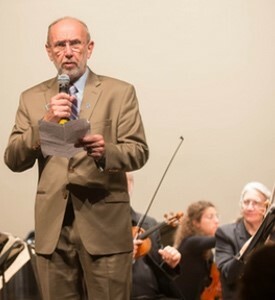 Strauss was principal violist of the Indianapolis Symphony Orchestra for 20 years and has served on the faculty of several prominent schools including Oberlin Conservatory of Music, Indiana University’s Jacobs School of Music, and Swarthmore College. He is a graduate of the Curtis Institute of Music and performs on a 1704 viola attributed to Matteo Albani of Bolzano, Italy. Cellist Austin Huntington made his solo orchestral debut at the age of ten and at twenty he was appointed principal cello of the Indianapolis Symphony Orchestra, currently making him one of the youngest principal musicians in a major American orchestra. Huntington is the recipient of numerous awards on both the national and international levels. He placed first in the 2012 Irving M. Klein International Strings Competition and the 2009 MTNA National Sting Competition, in addition to winning second place and the Audience Choice Award at the 2013 Schadt National String Competition. He has collaborated with artists such as Itzhak Perlman, Edgar Meyer, Robert deMaine, Cynthia Phelps, Jean-Yves Thibaudet, Krzysztof Urbanski, and Augustin Hadelich. Huntington performs on a Venetian cello made by Carlo Tononi circa 1725, on loan from the Colburn Foundation.